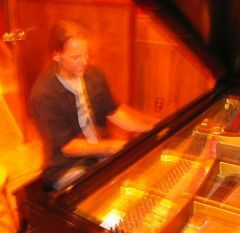 For over 40 years Steven Flynn has been singing and playing piano rooted in blues, boogie woogie, New Orleans R&B, rock & roll and jazz in barrooms, nightclubs, concerts, and festivals all over Seattle, the Northwest, and as far away as Moscow (both Russia and Idaho) and Tashkent, Uzbekistan. Besides working as a solo singer/pianist, he has played in many, many Seattle bands, including a decades long run with the notorious Jr. Cadillac. He’s also played piano for Chuck Berry in numerous concerts, and currently backs award-winning Americana singer/songwriter/guitarist Alice Stuart. Steve is delighted to bring a musical bordello/barrelhouse ambiance to the bar serving those refreshing adult beverages to the fabulous audience at the Moisture Festival Libertease Cabaret shows.